Sorry, your license key is invalid. If your license was purchased before July 31, 2018, use the form on the right to upgrade your license to version v4.x before you can download v4.0.2. If your license was purchased or upgraded before July 31, 2018, enter your license key above to purchase an upgrade for your license so that you can download v4.0.2. 💄 New facelift! Fresh new look! Sendy’s interface has been updated and enhanced with a fresher new look! Everything from colors, spacing, buttons to input fields have been improved aesthetically. Check out the new online demo to explore. You can now set custom domains for your brands. 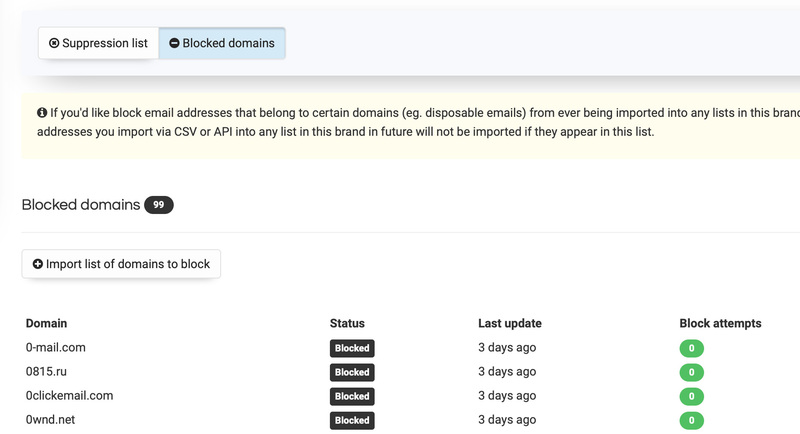 Once a custom domain is set, unsubscribe, web version and all trackable links in emails you send will use the custom domain set for the brand instead of the domain Sendy is installed on. Also, the custom domain can be used for the login URL that your client use to login to their brand accounts. 🧹 New House keeping section! You can now easily remove unconfirmed subscribers from the new ‘Housekeeping’ section. ‘Unconfirmed’ subscribers are those who did not click the double opt-in confirmation link to confirm their subscription. Easily remove users who are unconfirmed for 1 week, more than 1 week, more than 2 weeks or not at all. This will keep your database lean and mean. You can now easily remove inactive subscribers from the new ‘Housekeeping’ section. Easily remove all subscribers who did not open or click any campaigns ever sent to them. This will not only keep your list clean, you save even more money by not having to pay for emails sent to inactive subscribers. You can now import suppression lists! If you have email addresses that should never receive any email campaigns or autoresponders from you, import them into the new ‘Suppression list’. 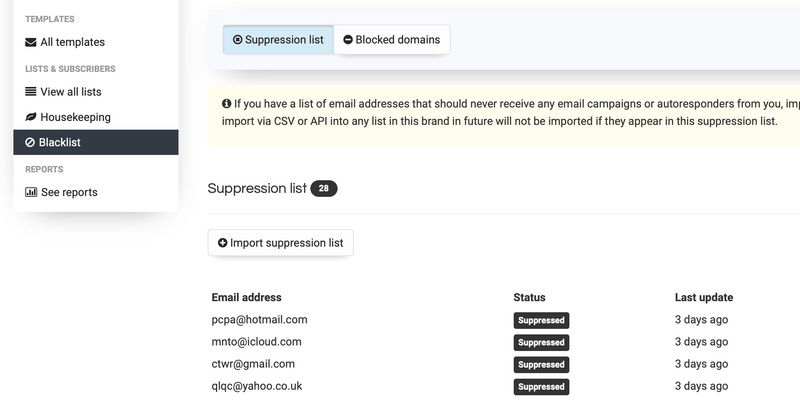 Any email addresses you import via CSV or API into any list in future will not be imported if they appear in the suppression list. If you'd like block email addresses that belong to certain domains (eg. disposable emails) from ever being imported into any lists in a certain brand, import them into the ‘Blocked domains’ list. Any email addresses you import via CSV or API into any list in the brand in future will not be imported if they appear in this list. 🖐🏼 Set "non expiring" sending limits for brands! Previously, you were able to set monthly sending limits for each of your brands. 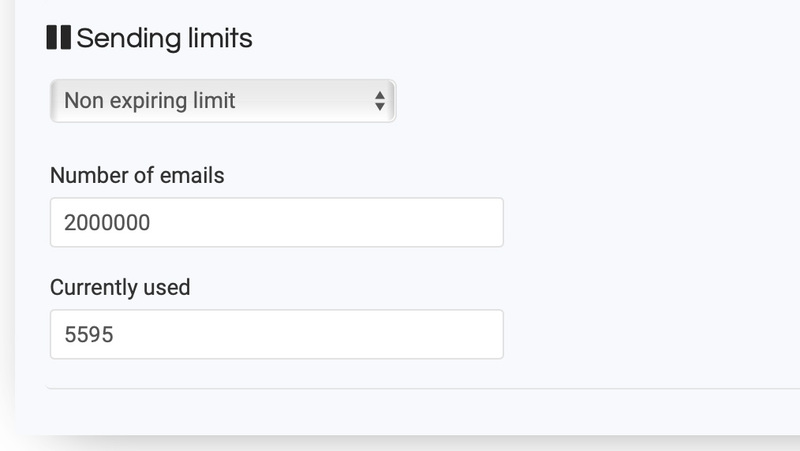 With this update, you can also set email sending limits that does expire (does not reset monthly). This is good if you've always wanted to sell email credits to your clients that does not expire or reset every month. ✉️ Email notifications on new signup! Get notified via email on new signups to any list! Instead of using Zapier to do this, it's now possible natively. You can now add notes to each individual subscriber! Make notes about certain subscribers so that you can look them up in future to remind yourself of the note you made of them. When importing CSVs, Sendy will now let you download a CSV export of email addresses that were skipped from the import process including their reasons. In the ‘Subscriber info’ modal window, you can now click anywhere outside the text field to save your changes in addition to hitting <Enter> on your keyboard. 'Brands' and 'View all lists' pages now have pagination. Added support to debug SMTP sending issues by appending &display_errors at the end of the ‘Define recipients’ URL. Full error message will be displayed if there are any issues with sending emails via SMTP. Changed the new GeoLite2 implementation (responsible for geolocation data) for better compatibility with all servers as the previous ".phar" method may cause some issues with subscribe form signups and campaign 'opens' tracking on some servers. Fixed saving list settings resulting in a blank page. Brand users will now be limited to certain settings according to their ‘privileges’ set by the main admin user. For instance, a brand user will not be able to edit ‘From name’ or ‘From email’ if the brand user is not granted ‘Campaign access’ privilege. Sendy now supports Google’s reCAPTCHA to protect your subscription forms from spam bots. You can enable them in the brand settings. .
You can now pass in a new flag called silent when calling the ‘subscribe’ API to signup the user with ‘single opt-in’ even if the list is set as ‘double opt-in’. Optimize creation of very large segments. Sendy now uses GeoLite2 (instead of GeoLite) database for country detection (supported on PHP 5.4+, falls back to GeoLite if PHP version is older than that). Fixed ‘unsubscribe’ API not able to unsubscribe email addresses from a list that’s set as ‘Double Opt-out’. URLs displayed under ‘Link activity’ in campaign reports will be truncated if the length is over 100 characters (clicking on it will still direct you to the full original URL). CSV exports of subscribers who clicked individual links in the campaign report now excludes users who unsubscribed, bounced or marked as spam. Fixed Amazon SES verification emails unable to send when there is a trailing slash at the end of the APP_PATH set in `/includes/config.php`. Fixed unable to export CSV of ‘unopens’ when campaign was sent to at least one segment. In addition to 'one click unsubscribe', you can now set the 'unsubscribe' behavior for a list to double opt-out (two click unsubscribe). When double opt-out is set, the recipient will need to click a confirmation link in the unsubscribe page to complete the unsubscribe process. You can set this new unsubscribe behavior in the list settings. The standard subscription form now presents a date picker instead of a text field if it is a “Date” based custom field. Security audit by GUIA Brahim Fouad (big thanks for your efforts! 👍). The new ‘shortened’ unsubscribe, web version and re-consent links introduced from version 3.0.8 may not work reliably for some users. Hence, these links are now reverted to original in this quick update. When importing a CSV, data of existing subscribers in the list will now be 'updated' instead of 'skipped'. For example if you want to update names or any custom fields of multiple subscribers in the list, you can import a CSV and Sendy will update any names or custom fields accordingly. Or if you want to tag existing subscribers with the 'GDPR' tag, you can import your CSV while selecting the checkbox "Apply GDPR tag to imported subscribers?". Deletion of a brand now removes all associated segments, autoresponders and Zapier web hooks. You can now create segments based on GDPR, Country and Referrer data! If you're sending re-permission campaigns and you want to send another campaign to remind your subscribers to opt-in, you can create a segment of your list that still do not have the GDPR tag (users who did not click the re-consent buton). The ‘GDPR safe switch’ can now be set separately for ‘Campaigns’ and/or ‘Autoresponders’ in the brand settings. Which means you can now set whether you want future ‘Campaigns’ or ‘Autoresponders (or both) to send only to subscribers tagged with ‘GDPR’. All trackable links, web version, unsubscribe, re-subscribe, re-consent links are now significantly shorter and more secure. Fixed subscribe API not returning Already subscribed if no gdpr parameter is passed into the call. This update introduces lots of new GDPR related features. The General Data Protection Regulation (GDPR) is a regulation in EU law on data protection and privacy for all individuals within the European Union. The GDPR regulation affects anyone in the world who collect and process the personal data of EU users. If you collect and process data of EU users, Sendy's GDPR features will be useful to you. The GDPR regulation kicks in on May 25, 2018. You now have an option to enable GDPR fields for your subscribe forms. This applies to both the ‘Ready-to-use subscribe form’ and the embeddable ‘Subscribe form HTML code’. In the same window where you retrieve the forms from a list, there is an option to enable GDPR fields. Some users collect data of EU users, some do not, so this is an option. The GDPR fields includes text areas for ‘Marketing permission’ and ‘What to expect’ so that you can inform users in the subscribe forms of what they are signing up for and what you’re going to do with the information they submit. Suggested language will be pre-populated in the text areas to make it easier for you to modify it to better suit your business. On either subscribe forms, subscribers will see these information including an unticked consent checkbox. They're required to check the ‘Consent’ checkbox in order to subscribe. Subscribers who have signed up in a GDPR compliant manner either through the ‘Ready-to-use subscribe form’ or the embeddable ‘Subscribe form HTML code’ will be tagged with a ‘GDPR’ label. If you are using the ‘subscribe’ API to signup users programmatically, there is a new parameter called gdpr where you can set it to true if you are signing up users in a GDPR compliant manner. This will tag the subscriber with a 'GDPR' label. If you're importing CSVs or using the 'Add name and email per line' method, you have an option to tag all imported subscribers with a 'GDPR' label. You can now easily send re-permission campaigns to make your lists compliant with GDPR - without having to do anything complicated. A new tag named [reconsent] is now available for use with your email campaigns. This tag will convert into a re-consent link when your campaign is sent to your subscribers. When the re-consent link is clicked, the subscriber will be tagged with ‘GDPR’. All subscribers who clicked this link will be tagged with ‘GDPR’. In future, you can enable the ‘GDPR safe switch’ (see below) in your brand settings so that Campaigns and Autoresponders will only send to subscribers tagged with ‘GDPR’. What can you do with subscribers who are tagged with a 'GDPR' label? In your brands settings, you can set Campaigns & Autoresponders to send to only subscribers tagged with 'GDPR' label. This will prevent you from accidentally sending emails to subscribers who did not signup to your list in a GDPR compliant manner. Also as seen in the screenshot above, you can set whether you want to see any GDPR options at all. If you don't store or process data of EU users, you can uncheck the GDPR options checkbox. In each subscriber list, a new tab named ‘GDPR’ (alongside existing tabs like Active, Unconfirmed, Unsubscribed etc) will appear if there are any subscribers tagged with a 'GDPR' label. You can filter or export CSV of subscribers in this new tab. When you delete a subscriber, you now have an option to delete the subscriber from ‘this list only’ or ‘ALL lists in the brand’. This will cater to the user's 'Right to erasure'. Two new columns are added in the ‘View all lists’ page which shows the number of ‘Segments’ and ‘Autoresponders’ created for each list. Clicking on the number takes you straight to the ‘Segmentation’ or ‘Autoresponders’ page respectively for the list. In addition to 'Campaigns' and 'Autoresponders, you can now use [Name,fallback=], [Email] or any custom fields as personalization tags in ‘Thank you’, ‘Double opt-in confirmation’ and ‘Goodbye’ emails set in your list settings. You can also use [unsubscribe] or <unsubscribe></unsubscribe> tags in your ‘Thank you’ email as well as [resubscribe] or <resubscribe></resubscribe> tags in your ‘Goodbye’ emails set in list settings. You can now set the number of rows to display in the campaigns or reports page in each brand’s settings. You can now set a default URL query string (eg. Google Analytics UTM parameters) in your brand settings. When you create a new campaign or autoresponder, the ‘Query string’ field will be automatically filled with this default string (which can be edited or removed if you wish). The Campaigns > Create API now supports passing in segment IDs to send your campaign to. It also supports passing in list and segment IDS to ‘exclude’ from your campaigns. Sendy will now send a ‘Password reset link’ prior to resetting the password when using the ‘Forgot password’ function on the login page. Only upon clicking the ‘Password reset link’ in the email sent to the requester will the password be reset. Sendy now captures subscribers’ IP address, country, referrer data and opt-in method when signing up via Sendy’s subscription forms. When you use Sendy’s subscription form’s HTML code or the subscription URL, IP address, country, referrer URL of where the subscription form is hosted and the opt-in method will be captured. These data are useful as evidence of a user explicitly signing up and giving you permission to send them emails should any dispute arise in future. Not only is storage of these information valuable to everyone in general, it is also useful for those who’re getting ready for the new General Data Protection Regulation (GDPR). If you're using the 'subscribe' API, you can also pass in ipaddress, country and referrer data into the API call. These new data will show up in the subscriber's modal window as well as CSVs exported from the subscribers' page or the campaign report. 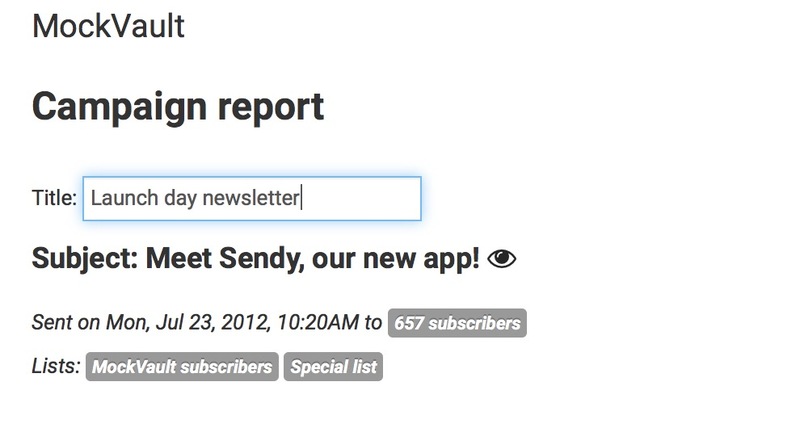 Sendy now takes advantage of Amazon SES's new Custom Verification Email Templates API. Previously, when initializing an Amazon SES verification process for any ‘From email’ address that have not been verified, Amazon sends you a verification email with their branding. Sendy now sends the verification email using a custom template without Amazon’s branding. If you use Sendy’s white label features for your clients, this enables brand users to use any ‘From email’ they want when logged in to their own account as verification emails are no longer branded with Amazon’s message and logo. Sendy will now initiate the Amazon SES verification process for your ‘login email address’ when you’re at the ‘brands’ page. Just click the verification email you receive from Amazon to complete the verification. Having your login email address verified enables password reset emails to be sent to you successfully via Amazon SES. Also, the above new custom verification email templates feature uses your login email address to send verification emails, hence it has to be verified. New option in brand settings to indicate if you’d like to receive ‘Campaign sent’ email notifications to your main account’s login email address when campaigns are sent from a brand. ‘Campaign sent’ email notifications will still be sent to the ‘From email’ address that’s used to send out the campaign irregardless of this setting. Added rel="noreferrer" to all links in the web version of your email newsletter so that the web version’s URL cannot be picked up by analytics software when any of the links are clicked. More info here. Thanks Graham Cluley for the tip. 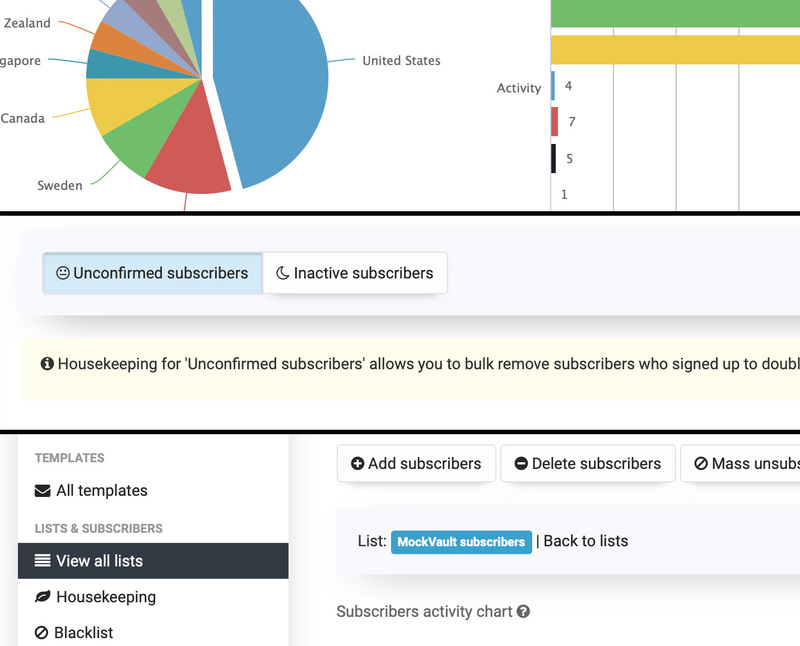 Added ‘Subscribers activity’ label to the subscriber’s activity chart in subscriber’s list. Also includes helpful info on what defines ‘Last activity’. Research shows sending emails to targeted segments not only improves open and click through rates, revenue can increase by more than 25%. Sendy now enables you to create dynamic segments for any list. Filter subscribers from any list based on conditions you define using default fields like ‘name’ and ‘email’ or any of your custom fields. Create multiple conditions and group them using ‘AND’ and ‘OR’ for each segment. Once you’ve created your segments, you can send targeted email campaigns to these segments in addition to lists. You can even choose segments to ‘exclude’ from your sends. Sendy just got really powerful! You can now select which list(s) you want to exclude from your email campaign. A good use case would be - say you want to send an email campaign to your ‘Prospects’ list. However, some subscribers from the ‘Customers’ list may exist in that list as well. Now you can exclude the ‘Customers’ list so that anyone from this list that may appear in the ‘Prospects’ list will not receive your email campaign. You want to have full control of what your client can or cannot access, now you can. Set whether the brand user can access campaigns, templates, lists & subscribers or campaign reports. The custom ‘Unsubscribe confirmation page’ URL in list settings now has a new variable %s that converts into a full ‘re-subscribe’ URL. For example if you set an ‘Unsubscribe confirmation page’ URL for your list like http://domain.com/unsubscribed/?resubscribe_url=%s, you can include a ‘Re-subscribe’ link in your page that uses the resubscribe_url GET parameter’s value as the re-subscribe URL. Links that starts with ‘ftp://' are now excluded from link tracking alongside ‘mailto://', ‘tel://' and ‘sms://'. If a user signs up to a double opt in list with an email address that ‘Bounced’ or ‘Marked as spam’ and attempts to signup with the same email address again, the double opt-in confirmation email will not be re-sent. The same email address will show up as ‘Bounced’ or ‘Marked as spam’ instead of ‘Unconfirmed’ in the list. Includes instructions to disable 'Grammarly' browser extension for the domain Sendy is installed on if Grammarly is installed in the browser. Grammarly browser extension inserts thousands of lines of code into the WYSIWYG editor causing many unexpected behavior. Fixed HTML email not rendering caused by a fix in the previous version. Patched PHPMailer class in Sendy in view of recently discovered vulnerability discovered by Polish security researcher Dawid Golunski on Dec 26, 2016. Sendy does not use the affected methods discovered in the report as Sendy uses Amazon SES API methods instead of sendmail or mail() functions to send emails. Though, the PHPMailer class has been patched nevertheless according to the latest version released by the authors of PHPMailer. Clients have full access to all functionalities in their own brand accounts by default. Now you have a new option in brand settings to allow clients to ‘view campaign reports only’. You can now enable or disable ‘opens tracking’ and/or ‘clicks tracking’ when creating/editing campaigns or autoresponders. Mouse over (instead of ‘click’) to highlight personalization tags when creating or editing campaigns or autoresponders. Removed the word “Template:“ when deploying a template for a new campaign. Sendy is now officially on Zapier! Anyone can now use Sendy on Zapier without using an invite link. Explore ready to use "Zaps" in the 'Third party resources & Integrations' page! Version '2.1.1' was supposed to fix a couple of things but broke something else instead. This update should fix everything. 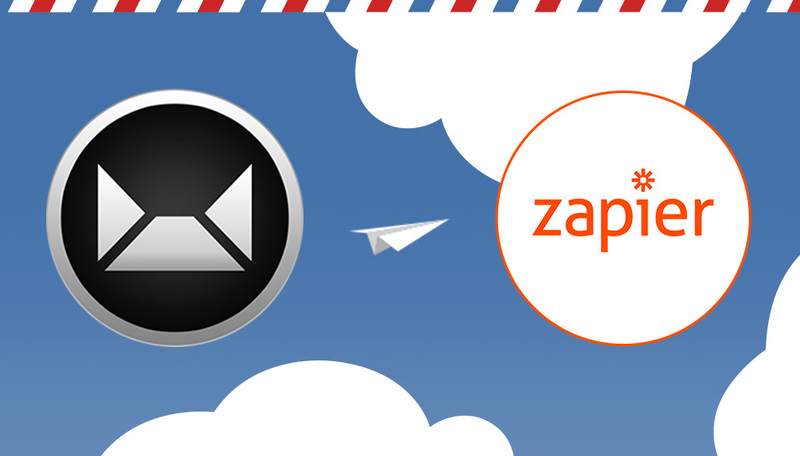 Sendy now works with Zapier! As part of Zapier's process of being listed in their official app directory, Sendy is currently in "Invite-only" mode. That means you'd need to visit this "Invite Link" in order to use Sendy integration in your Zapier account. Sendy is now officially on Zapier! That means anyone can use Sendy on Zapier without requiring an invite link. Added new %n parameter for populating subscriber’s name in GET URLs of 'Subscribe success page' as well as 'Subscription confirmation page' in list settings. Added step by step instructions on getting ‘OptInRequired’ error when fetching Amazon SES quota. Added Two-factor authentication support to provide an additional layer of security when signing in to Sendy! You can optionally setup two-factor authentication in your main settings. Your clients will also have the option to setup two-factor authentication for their own accounts. Sendy will now automatically send a verification request to Amazon SES to verify your ‘From‘ email address while you're at the ‘Define recipients‘ page if you did not verify the ‘From‘ email address. You no longer need to visit your Amazon SES console to verify your ‘From‘ email address. Sendy will now automatically setup ‘bounces’ and ‘complaints’ handling for you. Automatically populate the email text field in ‘Forgot password‘ modal window with email address entered in login form when clicking ‘Forgot password’. Amazon recently changed the email address formatting in their SNS notifications resulting in some inconsistencies in bounces and complaints handling, this update fixes this. Emojis are now supported for any emails you send with Sendy! Note: Please set '$charset' to 'utf8mb4' in /includes/config.php in order for emojis to work. If you're installing a fresh copy of Sendy, you don't need to do anything. Increased loading speed of ‘All campaigns’ view if you have a high volume of subscribers. Increased character limit for links in the database. Fixed an issue where subject line is blank when using accented characters for Sendy installations on PHP 7 and up. Importing of CSV ‘without a cron job setup’ will now skip emails that are marked as ‘unsubscribed’ in other lists within the brand. Special characters in subject lines no longer causes campaigns RSS feed to stop loading prematurely. Changed the copy for ‘Outgoing connections blocked’ error. Fixed a slight glitch with the API where ‘You’re already subscribed.’ message doesn't return when it’s true. Rolled back CKEditor to the last working version as the latest version of CKEditor has a bug preventing the WYSIWYG editor from loading. You can now set file type restrictions for campaign or autoresponder attachments or even disable uploading of attachments altogether in each brand settings. The default allowed file types are “jpeg, jpg, gif, png, pdf and zip” but you can edit this list any way you like in brand settings. If you’re importing subscribers (either CSV or per line) into a list that has its settings set to ‘Unsubscribe from ALL lists’, the import will skip any emails marked as ‘Unsubscribed’ in any other lists in the brand. This is such that when you create new lists in future and import subscribers into it, any emails already marked as ‘Unsubscribed’ in other lists within the brand will be skipped from the import. Emails that are ‘Marked as spam’ works the same way. Emails marked as ‘Bounced’ continues to work the same, records will be skipped if an email is marked as ‘Bounced’ in any list and in any brand. Enable table sorting for ’All campaigns’ , ‘View all lists’, ‘Subscribers’ and ‘Campaign reports (clicks and countries data)’ pages. When a subscriber marks an email as spam, it’ll be registered in all lists the email address exists in. Similarly, for any email that was already marked as spam in any list in a brand, future imports of the same email will be skipped. Changed copy to no longer use ‘Production access’ as Amazon has changed the term to ‘SES Sending Limits’. Sendy has been audited by Acunetix in this update for XSS and SQL injection vulnerabilities. All possible vulnerabilities have been fixed. Added meta data to prevent your Sendy installation from being indexed by search engines so your Sendy installation remains private and hence more secure. When appending query string (eg. 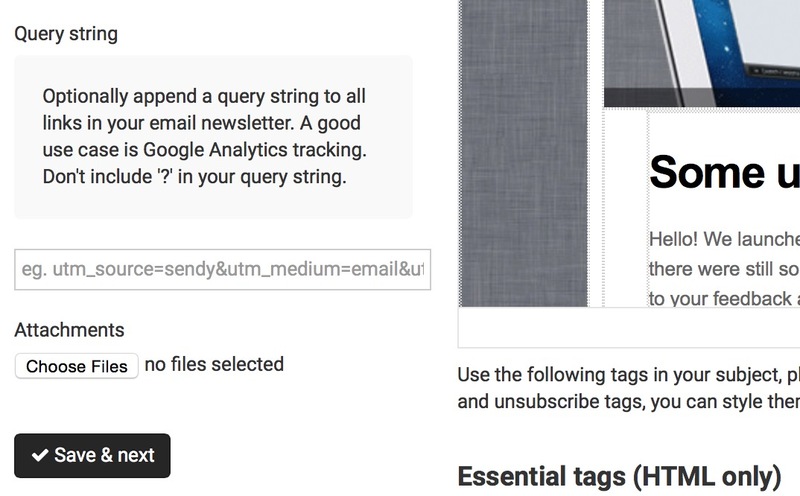 Google Analytics query strings) to URLs in an email, Sendy now checks for existing query strings appended to the URL, if so, the query string you set in your campaign will be appended with & instead of ? You can now store templates! Create and store templates for later use! You can now search across ALL lists so that you can make unsubscribing, deletion or editing decisions more effectively. You can now add a query string when creating/editing a campaign so that it will be appended to all links in your email when you send out your campaign. Upload custom logos for your brands! You can now upload logos for your brands! Your custom logos will be displayed alongside brand items on your brands page. This logo will also appear at the top bar (on the left) when your clients login to their accounts. If no brand icon is uploaded, icon image will fallback to using favicon of the brand's 'From email's domain. Export CSV of recipients who did not open your email! You can now download a CSV of recipients who did not open your email newsletter from the campaign report for resending to recipients who did not open your email. Set custom 'campaign titles' to your campaigns! You can now set titles to your campaigns to differentiate campaigns of similar (or same) subject lines for your personal reference. The custom title you set will appear in 'All campaigns' section and in campaign reports. Sendy now uses CKEditor! A much better and stable WYSIWYG editor, hope you like it. 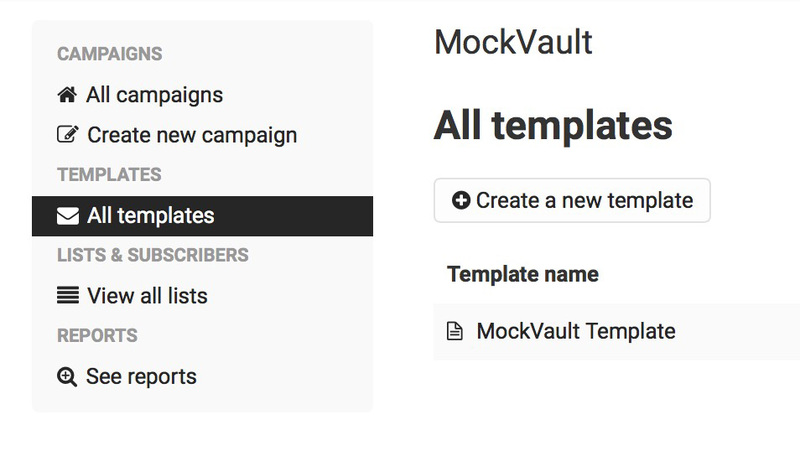 New API for creating and sending campaigns! This opens up lots of possibilities. Fixed a bug with web version link displaying a blank page in Autoresponder triggered emails when [webversion] tag is used instead of <webversion></webversion> tag. You can now pass 'Email' and 'ListID' data into your custom 'unsubscribe confirmation URL' using %e and %l tokens in your custom URL in list settings. Still the same Sendy you love but with an improved user interface. Many details have been tweaked to give Sendy a lighter and fresher look. You can now optionally set a monthly sending limit for each brand! You can also specify which day of the month should the limit reset. All emails will count towards the limit, eg. opt-in confirmation emails, thank you emails, goodbye emails, autoresponder emails and of course, campaign emails. You can now use personalization tags for dates in both 'Campaigns' and 'Autoresponders'. You will see the new tags when creating or editing a campaign or autoresponder. More descriptive copy for 'Export' button in lists depending on which tab user is on. Information: Sendy is widely used by thousands around the world and we take security very seriously. Measures have already been taken to prevent SQL injection. Sendy has also been worked to guard against MITM attacks as well. If anyone claims to have exploited Sendy via SQL injection based on Sendy's online demo, any result is not an indication of vulnerability with the actual build of Sendy as the online demo does not use the same updated and secure code the actual build uses. Added support for the new Amazon SES US West (Oregon) region. If the physical location of your hosting server is in the west of US, it's recommended to use 'US West (Oregon)' as your Amazon SES region. For more information, please see Amazon's official announcement on the new 'US West (Oregon)' region. All 3 Amazon SES regions are now supported, US East (N. Virginia), US West (Oregon) and EU (Ireland). You can select which region you want to use Amazon SES to send emails from in the main Settings. Added support for the new Amazon SES EU (Ireland) region. If the physical location of your hosting server is in Europe, it's recommended to use 'EU (Ireland)' as your Amazon SES region. For more information, please see Amazon's official announcement on the new 'EU (Ireland)' region. Converted column type of two tables in campaigns table that stores list ids to "TEXT"
Invalid list ID for consistency with other error messages. [webversion] and [unsubscribe] tags can now be used in the HTML version of your campaign or autoresponder. These tags will be converted into a raw web version or unsubscribe URL. Changing the "i" variable in the URL at the Define Recipients page will now redirect user back to their own brand when logged in as a 'brand' user. Sendy sets database character set to utf8 by default. For users who's language requires other types of encoding to display text properly, eg. Chinese, Vietnamese, etc, add this line to /includes/config.php eg. $charset = 'utf16'. cURL operations now checks for validity of remote SSL certificates for enhanced security. A CA certificate bundle is also included in this build in case it is not installed on the server by default which will cause certificate validation to fail. Check that 'From name' does not contain commas before saving as emails will not send with commas in the 'From name'. Checking of sending time outs will be stopped in case user clicks "Resume" while already having cron resume sending when sending time out which will eliminate possibilities of sending an email to a recipient more than once. Found and fixed the root of the issue with emails containing attachments not being able to send if attachment size is more than 500+ kb. ID encryption now handles openssl_encrypt not able to encrypt IDs, e.g.. if Sendy is accessed via "https"
Fixed a minor bug where campaigns does not "auto resume" when server times out. Localization support. You can now translate Sendy into any language. Language can be set for the main account user or any brand account user. See how to translate Sendy. You can now import CSVs via cron. With cron, there's no need for your browser window to be opened while importing. Sendy will also automatically resume import if your server timeout. This is especially useful when importing large CSVs as everything will be handled in the background. You can now print reports with header and sidebar removed. Some font colours have been changed for more legibility in the printed report. When creating or editing a brand, your 'From email' will now be checked to see if it's verified in your SES console. Instructional message will be displayed if the 'From email' is not verified. Sendy now checks if bounces and complaints have been setup (and will remind you if they're not set up) before sending out your campaign. Checks will only be done once per 'From email' unless bounces or complaints have not been setup for the 'From email' in question. All IDs are now encrypted with AES-256-CBC encryption method (used by the U.S. government to encrypt top secret documents) and hashed with your API key. This makes URLs of web versions, open tracking, link tracking, subscribes and unsubscribes even more secure. Added support for attachments! You can now attach one or multiple attachments to your campaigns or autoresponders. Refer to supported attachment types appendix. Added 'subscription status' API. Check if an email is subscribed, unsubscribed, unconfirmed, bounced, soft bounced or complained from a list. Added 'active subscriber count' API. Get the total active subscriber count from any available list. Replaced original MySQL functions with MySQLi ahead of the latest PHP 5.5.x version (currently in alpha). mysql_* functions will be deprecated starting from PHP 5.5, this update uses mysqli_* functions, thus making Sendy future proof. Edited the entire codebase to remove PHP warnings and notices as much as possible even though they don't affect functionality. Throttle sending to the EXACT amount of microseconds needed. Save content when switching from HTML to WYSIWYG editor and vice versa (applies to both campaign and autoresponder email editors). Sending and scheduled buttons will be disabled for users logged in as brands when selecting a combination of list with more recipients than Amazon SES quota allows. Removed tooltip when hovering over trash icon in subscriber list as it may cause flickering on small screens resulting in difficulty deleting a subscriber. Better layout for database and license error messages. When new update is available, the 'get updated' link in footer will include user's license so the license field will be pre-populated. Clearer placeholder text for setting login email and password on installation page. Support for dashes and question marks in custom field names. Include a note in sidebar that says sending via your server is not recommended when no AWS credentials is available in settings. Added an extra check before sending the 'campaign sent' confirmation email. Fixed a small bug where 'Last 10 opened' in report shows two of the same recipients when there are exactly two recipients who currently opened the email. Removed an extra IP address generated by some servers when using PHP's getenv() function. Trimmed spaces in email when using line import to prevent duplicates from slipping through. Set CURLOPT_SSL_VERIFYHOST and CURLOPT_SSL_VERIFYPEER to 0 to prevent sending failure when sending without using cron on some servers. Check if function exists for geoip_country_name_by_name() and geoip_country_code_by_name(). Changed comment in .htaccess from 'Open tracker' to 'Web version'. Removes large query string data after setting 'sent' as '1' in the queue for every email sent. This dramatically reduces database size and increases sending speed by 4x. Changed queuing method. Each email record in the queue will be marked as sent when sent instead of deleting the email record. The entire queue for a particular campaign will only be deleted once all emails are sent. Also added a conditional statement to check if an email already exist in queue before adding. These measures are to doubly ensure no duplicates will be sent in all cases. Re-adjusted multi-threading code so it does not rely on curl_multi_select(). Later versions of PHP like 5.3.18 loops multi-threading code until timeout as it always returns failure code instead of correct number of parallel connections. Now features 'automatic retry' when any email was not sent through for any reason. 'http error code' and 'subscriber id' will be captured in the database for any reason Amazon SES was unable to deliver an email. Also available as a CSV download. Even more robust CSV import. Improved handling of line endings, encoding, etc. Fixed a bug where hard bounce wasn't registered after 3 soft bounces. Fixed a problem where 'queue' table was not created in the database of some users for some reason resulting in emails not being sent. If you haven't checked out 1.1.0 released 3 days ago, view the 1.1.0 change log to see what's changed. Multi-threading and auto resume are now supported. Get ready for high speed sending! :) If you've already upgraded to 1.1.0, sorry for releasing an update so soon. Subscribe form and API now returns Already subscribed. if email is already subscribed and 'active' in the list. You may want to adjust your existing code to handle this new output. If you're worried that the subscribe form and API previously don't check for duplicates, don't worry, it does. Just that it doesn't output Already subscribed. previously. Now it does! Multiple emails are sent in parallel according to your SES send rate resulting in huge improvements to sending speed. Especially for BIG senders, sending will automatically resume even if your server times out. Just make sure cron is set up. SMTP is now supported. Note that Sendy is built for Amazon SES, we built in SMTP so that there's an option. Bounces and complaints won't be registered if emails are sent using SMTP. The same goes for if emails are sent via your server (if AWS credentials is empty in Settings). Loading of lists is now faster. Query for counting of total subscribers, unsubscribes and bounces are now optimized. Users of huge lists will notice a big difference. Personalization tags are now supported in links. 'a href' codes in HTML body does not need to be in a specific order for Sendy to detect it as a link. We are excited to announce - Autoresponders! You can now create autoresponders. There are 3 types of autoresponders you can create, namely, drip campaigns, emails that sends annually or on a specific date based on a date based custom field. CSV or line imports will now be scrubbed against previously marked as bounced emails. Emails that have been previously marked as bounced (no matter which list they belong to) will not be imported. Campaigns will now send via CRON if CRON has been set up. If CRON is not set up, a message below the sending button will recommend user to set it up. Sendy now handles complaints. When a user marks your email as spam, their email will be flagged so no future emails will be sent to them. To enable complaints, please complete Step 8 in the Get Started Guide. You can now schedule emails to send at a later time! By downloading and using Sendy, you agree to Sendy's End User License Agreement.